2012 Toyota Innova variants and prices across major cities! Toyota launched the facelifted Innova at the 2012 Delhi Auto Expo with minor upgrades in the form of redesigned headlamps, taillamps, bumper, a refreshed central console, touch screen DVD system with six speakers and Bluetooth. The Innova facelift is powered by the same engines that powered the previous model. The 2.5-litre, D4D diesel motor makes 101 bhp of max power and 204 Nm of max torque while the 2-litre petrol motor makes 130 bhp of max power and 181 Nm of max torque. The Innova is the best selling multi-purpose vehicle in the Indian MPV segment. Since its launch back in January 2009 it has attracted buyers and has surged ahead of its competition like the Mahindra Xylo, Tata Sumo Grande and the Chevrolet Tavera. 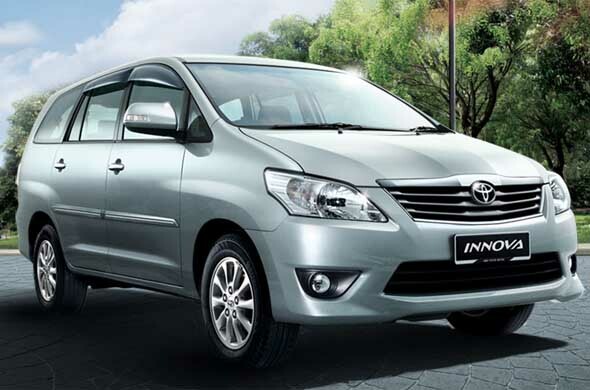 Today, the Innova is the preferred choice, not just among large families, but also for taxi fleet operators. This is because of its low maintenance costs and long term reliability. The 2012 Innova is now available in four variants, the base E variant, the G variant, the GX variant and the top-end VX variant. Let’s take a look at each of these variants, their features and prices. The E variant does not get an engine immobilizer, electric mirrors, central armrest and speakers. Given below are the features offered in the E variant. The G variant gets all the features offered in the E variant and in addition gets electric mirrors, power windows, power door locks, keyless entry and immobilizer. Listed below are the features offered in the G variant, along with a table with its prices across major cities. The GX variant gets all the features of the G variant and in addition gets driver airbag, rear wiper, clock, tachometer, driver seat height adjustment and rear AC vents (for 2nd & 3rd row). Listed below are the features offered in the GX variant, along with a table of its prices across cities. The VX variant is the fully loaded with safety features such as ABS, airbags and immobilizer, comfort features such as 2 DIN LCD display, DVD, Bluetooth, USB, Aux-in, Touch screen, 6 speakers, audio & Bluetooth control on steering wheels. Listed below are the prices and features of the VX variant. *All the prices mentioned above are for 7 seats configuration.